There's no wider reach than email! Not even social media can top it. The average order value of an email is at least 3X's higher than social media. For every $1 spent, email marketing generates $38 in ROI and 3 billion people will use email by 2020! These stats are exactly why we created this Email Marketing Case Study to add to the proof that email marketing is a worthwhile investment. With this Email Marketing Case Study, Kulture Konnect tells the story of how Jimmy's Famous American Tavern (JFAT) made the jump to not only improve their email efforts, but also to create content that offers a unique customer experience! If you think of your email marketing as a set of promises delivered to your customers, then it makes sense to review those promises periodically to see if they are up-to-date and signaling your values. The first step is to work with a marketing and design studio to go through your email marketing strategy and ensure you have covered all the basics. >>See the results for yourself! Email Marketing Case Study Today! This is a very small glimpse into a comprehensive Email Marketing Case Study, which we have developed just for you. If you are starting the process or you're in the middle of your email marketing strategy and not sure how to strategize your restaurant email marketing, contact us! 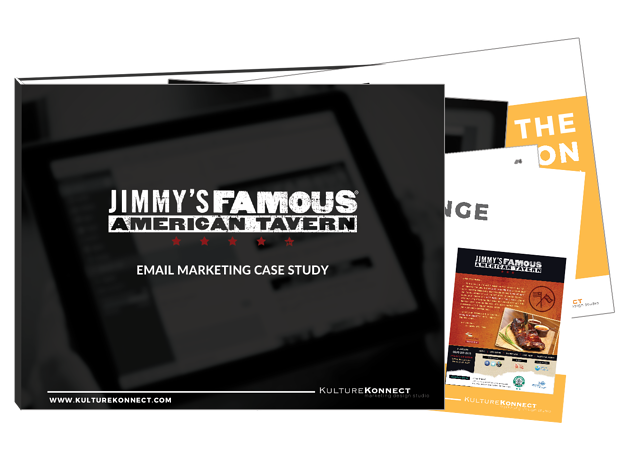 Email Marketing Case Study on Jimmy's Famous American Tavern here!